Last month I read the most extraordinary obituary in the Washington Post: A Local Life: Irvin Leigh Matus, 69, penniless Shakespeare scholar who lived by his own design. Ever since arriving in Washington in 1985, Irvin Matus seemed to survive on little more than charm, wit and the kindness of friends and strangers. He seldom had a paying job — mostly out of stubborn pride — choosing instead to spend the past 25 years as an independent scholar of the life and works of William Shakespeare. He showed up each day at the Library of Congress or Folger Shakespeare Library to conduct his research, then slipped away in the evening to cadge food from Capitol Hill cocktail receptions, striding in as if he were a congressman. It reminds me of Six Degrees of Separation, except that he wasn’t scamming anyone — it’s how he wanted to live his life! He just wanted to study, so he hung out all day on Capitol Hill at the Folger Shakespeare Library and the Library of Congress and sometimes, when he had nowhere else to stay, he slept at a nearby construction site and then cleaned up in the morning in the public restrooms. When people asked where he lived, Matus answered, “The Hill,” like everyone else in the DC neighborhood around the Capitol building. I get such a kick out of this! What a character! He wrote magazine articles for Harper’s and the Atlantic and went on to publish in 1994 a second book, “Shakespeare, in Fact,” which has come to be recognized as a near-definitive refutation of the argument that the works of Shakespeare were written by someone other than the historical Bard of Avon. Wow! So, as you may remember from my previous brief foray into the authorship question, I am not very interested in it. I don’t really care about the conspiracy theories. It’s just noise to me. Beside the point. But I thought this guy was so interesting that I wanted to see his book. I was able to get it through inter-library loan, so I ordered it. 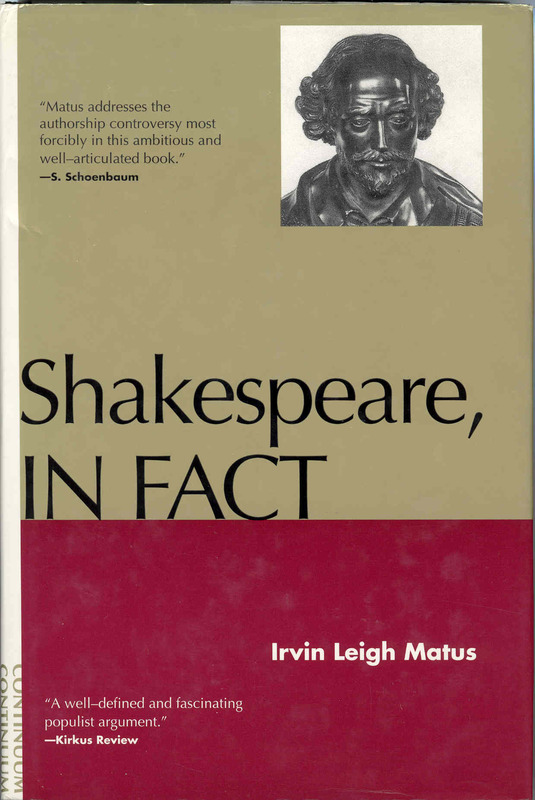 ILL doesn’t give me much time with it, and frankly, I’m not that interested in the minutiae of the arguments, but I can say after skimming: anyone who wonders whether Shakespeare was really Shakespeare should take a look at this book. Matus takes every little piece of evidence used by Oxfordians (people who argue that Edward de Vere, 17th Earl of Oxford, actually wrote the plays) and explains in minute detail everything he found in his research to refute each minute detail. This book is minutiae.